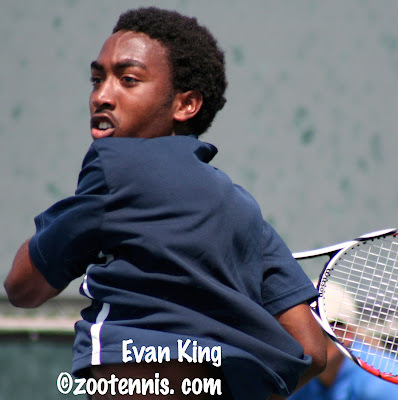 It's rare that a match point tells the tale of any contest, but the one that gave Mitchell Frank the International Spring championship over Evan King Sunday morning was a perfect microcosm. The ball went back and forth across the net dozens of times, with lines hit, sure winners returned, with a few net cords thrown in for added suspense. 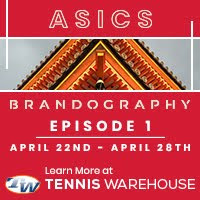 The couple of dozen spectators were certainly as exhausted as the players when Frank finally put away an overhead to earn a 6-3 6-4 victory, one that was two hours in the the making, and a marathon from the very beginning. "The first game lasted about a half an hour and the second game lasted about another half an hour," said Frank, 16. "I looked over and saw the girls off the court, and we were like 3-2 in the first set; I was like, wow." King, who called the match point "ridiculous," wasn't surprised by the length of the points and games. "Both of us are pretty consistent players," said King, 17. "Neither of us miss a ton, which led to the long 4 and 3, but whoever can take advantage of more points got the better of it. It was a strategic battle to see who could get on offense; it was pretty fun out there." Frank, who downed top seed Denis Kudla in three sets in Saturday's semifinal, credits playing well on the big points for his outstanding week. None were bigger than the point he won with King serving at 4-4 30-40 in the second set. King hit a good drop shot that was on its way to its second bounce when Frank somehow reached it and scooped it over the net. A surprised King, who admitted he was just watching his shot and not preparing for the next one, popped the ball back over the net, where a waiting Frank coolly volleyed it past him. "He made a bunch of incredible gets, and that was just a perfect one," King said. Frank doesn't consider himself a speedy player, but court coverage is one of his strong suits. "I'm not necessarily a fast guy, I just have good court movement, pretty good court sense and anticipation," Frank said. "But that one, I didn't even think I was going to get to it, I was just running after it, but I got it, and he was pretty surprised." Frank was broken only once in the match, in the second game of the second set, but that just brought King even. Although he doesn't have a notably big serve, Frank was holding more easily than King, and simply did not make errors when it counted. Serving for the match at 5-4, 15-30, Frank followed a good first serve to the net to put away a volley, and then outlasted King in a preview of the epic match point at 30-30, with King hitting a forehand long. As Frank leaned over the net, trying to catch his breath while King approached for the handshake, he could think ahead, not only to next week's Easter Bowl, but to the French and Wimbledon Junior Championships in a couple of months. 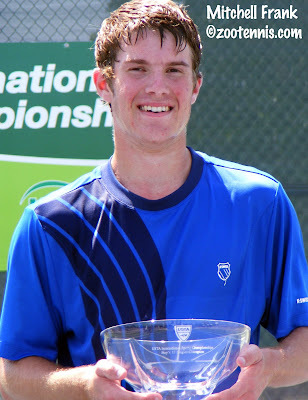 "This should move me up to about 38 or 40," Frank said of his ITF ranking, which is currently at 88. "So that's a pretty big jump, and it means less pressure next week." 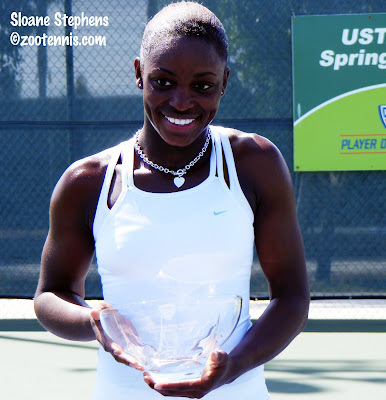 Girls champion Sloane Stephens, who defeated unseeded Grace Min 6-1, 6-2 Sunday morning, is not playing the Easter Bowl, so the 16-year-old has an opportunity to savor her first ITF Grade 1 singles victory. The ninth-seeded Stephens, who trains at the USTA Training Center-West in Carson, played all six of her matches on Court 5, and also won the doubles title there on Saturday. "I think this is my lucky court," Stephens said. "Last week when we were playing practice matches on these two courts (4 & 5), I never won a match over there, and I won all three matches over here." In Sunday's final, Stephens broke Min at love to open the contest, and the precise power that Stephens displayed never gave Min a chance to get into the match. "I wanted to come out really aggressive, because Grace fights really well, and she beat a lot of good players in this tournament," Stephens said. "I think she might have been a little nervous at the beginning, and she missed a few balls she shouldn't have missed. She couldn't really settle down." Min disagreed with Stephens's analysis, at least on the surface. "That was weird," Min said of her error-filled start. "I came in, I wasn't nervous, feeling good. I don't know. Maybe deep down I was nervous. I made more errors than I thought I would and it took me by surprise actually." 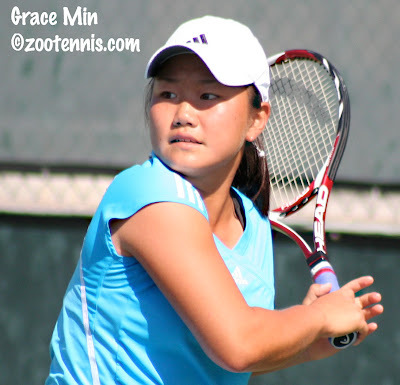 Min, who will have another match on Monday in Palm Springs, gave credit to Stephens's play. "I had a tough time finding the court, and she doesn't give you anything," said Min, who turns 15 next month. "She was on me the whole time. I can't really say anything else, she just played a really good match." Stephens dominated every match during the week, save the quarterfinal against top seed Lauren Embree, where she battled back from a set down to get the win. After a day off on Monday, she will continue training at Carson, then will accompany the U.S. Fed Cup team to the Czech Republic as a hitting partner later this month. Stephens would probably like to pack up Court No. 5 and take it with her. 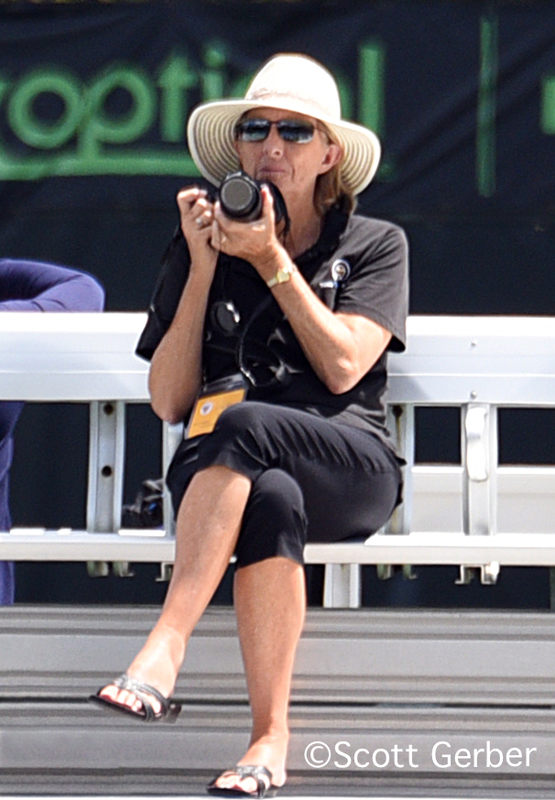 Colette, your in-depeth coverage of junior tournaments is truly remarkable and very appreciated. When talking to Sloane did you gather her reasoning for not playing the upcoming Easter Bowl? Thanks. Stephens was originally hoping to play the $25,000 Pro Circuit event in Osprey, Fla. this coming week, so the Easter Bowl wasn't on her schedule. Ah thank you. It is too bad, she would have been a great addition to the field. Ben Becker played his old Baylor teammate Benedict Dorsch in the Baton Rouge challenger this past week with Becker winning 6-3,6-0. Must feel nice considering he played behind him their junior and senior years. Any idea about the pro/college plans of Kudla and Frank? They're training only two hours from UVA. King is going to Michigan, right? Who from the 10-11 group is planning on turning pro? I had a chance to watch Sloane play doubles recently in Miami. It's great to hear that she will accompany the Fed Cup team as a hitting partner during the semifinals. Wow, Kudla gets Sarmiento and Sandgren gets Sock in the first round. Those might be the two toughest unseeded guys in the draw. What are the odds of those two guys getting the top seeds in the first round? Should be fun to watch the results. kudla has officially turned pro, he signed with an agent late last year. as for frank i am not sure.